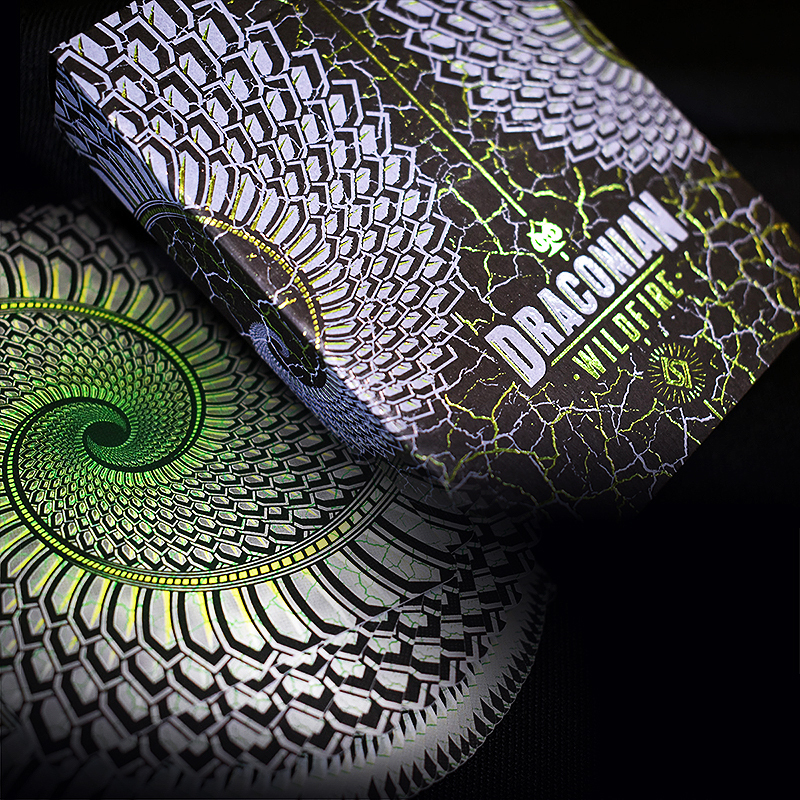 Inspired by Dragons of lore, the Draconian Wildfire Deck exudes the energy of an intense green fire. Printed by Legends Playing Card Co., with their Taiwan printer, the Draconian Wildfire Deck utilizes their exceptional Classic Finish. The Back Card features a borderless optical illusion design formed from Dragon Scales. The semi-custom Face Cards incorporate a clean design that keeps them functional and provides the highest level of playability. Each Card Back and Face contains elements of borderless green wildfire fissures throughout a rich black background. The details are crisp and the colors are striking. The Tuck Box is highlighted by the symmetrical Dragon Scales design. The Tuck is produced on a Black Matte paper stock, features a Green FOIL, and a Pantone Grey that also has a Clear UV Spot Ink overlay. The Draconian Wildfire Deck is perfect for any Collector, Card Player, Magician, Flourisher or fan of Dragons! • The cards are poker size.